The Magnificent Mile, sometimes referred to as The Mag Mile, is an upscale section of Chicago's Michigan Avenue, running from the Chicago River to Oak Street in the the Near North Side.The district is located adjacent to downtown, and one block east of Rush Street. The Magnificent Mile serves as the main thoroughfare between Chicago's Loop business District and the Gold Coast Neighborhood. It is generally the western boundary of the Streeterville neighborhood, to its east and River North to the west. The Mag Mile's history dates back to 1871 when the Great Chicago Fire sent the city up in smoke. Miraculously, the flames spared the Water Tower and Pumping Station, which still stand as reminders of the structures that once lined this now famous street. 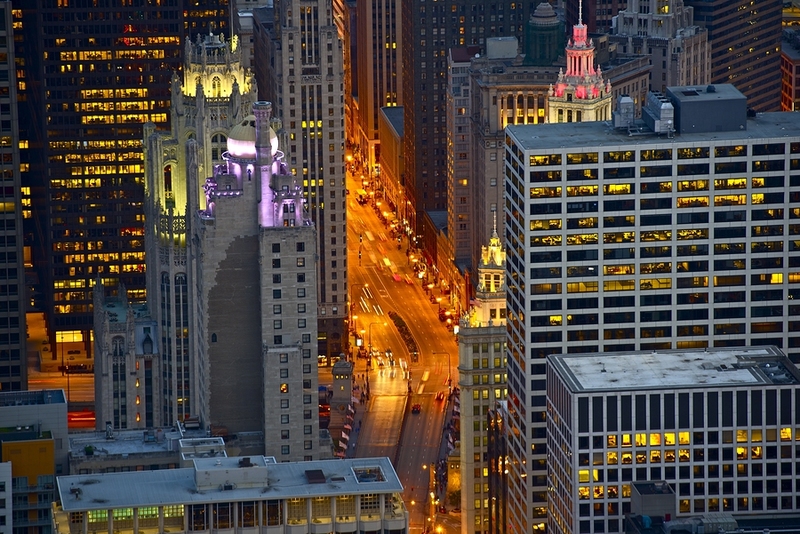 Michigan Avenue is also punctuated by the neogothic Wrigley Building and Chicago Tribune Tower, as well as 875 N Michigan (formerly the John Hancock Center), Chicago's fourth tallest building with postcard-worthy views from its 94th floor observatory. The Mag Mile is currently Chicago's largest shopping district, various mid-range and high-end shops line this section of the street; approximately 3,100,000 square feet are occupied by retail, restaurants, museums and hotels. Tall buildings such as the John Hancock Center are in the district. Landmarks along the Magnificent Mile include Wrigley Building, Tribune Tower, Water Tower, Allerton, Drake, Intercontinental Hotels.